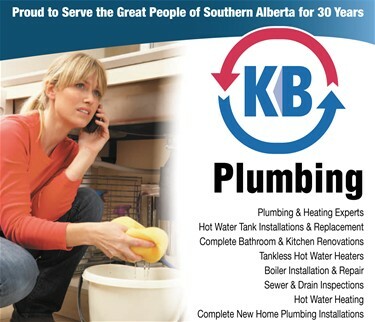 KB Heating is proud to offer Lethbridge and area the best plumbing products the industry has to offer. We can develop a quality system for you based on your specifications and requirements. Need a new hotwater tank? We are pleased to offer remove and replace service on all of our hotwater tank installs. We also do custom plumbing installations such as total spa packages that include steam units and multiple head body spray installations. All of our installations are backed by a 1 year labour warranty. If you would like a KB representative to review any requirements you may have, just call us or visit our website to request an in-home consultation. Our showroom in Lethbridge features the latest in faucets, tubs and sinks from a variety of manufacturers including Delta, Kohler and Luxart. We are located at 3569 32 Ave North.